Despite the fallout surrounding Cambridge Analytica’s breach of the personal data of 87 million Facebook users, the “social network” was not impacted in demand from advertisers, according to an analysis of the first-quarter social network's advertising marketplace published this morning by media planning and buying platform 4C. Facebook’s advertising revenues jumped 62% in the first quarter of 2018 versus the same quarter a year earlier, according to 4C's "The State of Media" report. The report does show a sequential decline of 34% from Facebook's fourth-quarter 2017 ad revenues, but that likely reflects seasonal demand from advertisers. 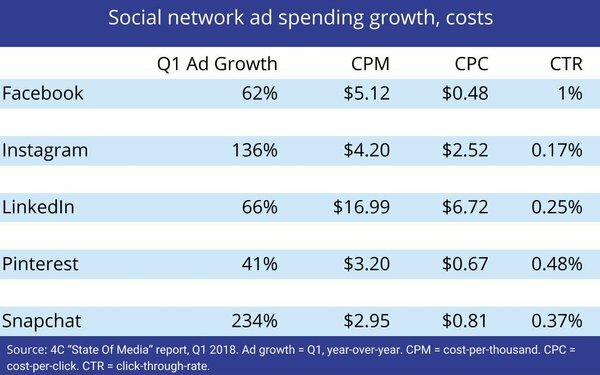 At $5.12, Facebook's current CPM is not the most expensive among the major social networks -- LinkedIn's $16.99 is -- but that likely reflects the employment and recruitment advertising market norms, versus conventional consumer marketing. With a click-through rate more than twice that of its next-closest-performing competitor Pinterest, Facebook is still a pretty good deal, according to the analysis, which shows it yielding the most efficient cost-per-click -- just 48 cents.